Seth Petruzelli celebrates the biggest win of his career after knocking out Kimbo Slice. The man who knocked out Kimbo Slice with the shot heard round the world has signed with WWE as a striking coach in their developmental system. Seth Petruzelli who defeated Slice back in October 2008 was a last minute replacement for the Elite XC show that was to be headlined by Ken Shamrock and Kimbo. Shamrock was injured earlier in the night and Petruzelli moved up on the card, knocking out the Youtube sensation. The Shamrock – Kimbo bout finally happened earlier this year in Bellator MMA with Slice getting the win. Petruzelli has joined the WWE Performance Center in Orlando, Florida to help the developmental WWE talent with their striking, as that has become part of the training regimen for WWE hopefuls. 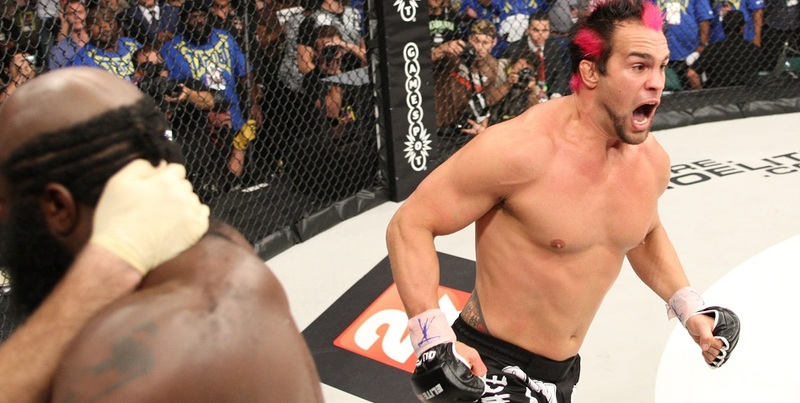 Petruzelli’s last MMA bout came in June 2013, a knockout loss to Muhammed Lawal (King Mo) at Bellator MMA 96. Petruzelli has already reported for duty as noted below.